You always knew the day would come at some point, but when it did, it still inspired a feeling of shock. Jim Mallinder is leaving Saints. The director of rugby has been a fixture at Franklin’s Gardens since taking charge during the summer of 2007. Back then, Saints were at a low ebb. They had been relegated to England’s second tier and one of the country’s giants required surgery to get it back up and running. Mallinder set about his work and a year later, Saints could celebrate a blemish-free campaign and look forward to life in the Premiership again. What followed was a brilliant building process with players such as Lee Dickson and Ben Foden - who would become the heartbeat of the club - helping to lay the foundations. After a season of consolidation, during which Saints won the Challenge Cup, Mallinder’s men could really push on. They added more natural leaders in the shape of men such as Phil Dowson and Tom Wood. They won the Anglo-Welsh Cup in 2010 and finished in the Premiership’s top four for six successive seasons, combining domestic success with a tilt at the Heineken Cup crown in 2011. That run to the Cardiff final was astonishing, with Saints’ forward pack, tutored by Mallinder’s long-time sidekick, Dorian West, crushing all before them before the second half of the showpiece saw glory cruelly ripped from their grasp. Only the heroics of Jonny Sexton and the clear fatigue of a small but hugely talented green, black and gold squad prevented Europe’s major crown returning to Northampton for the first time since 2000. After losing the Premiership final to Leicester in 2013, Saints saw traditional pillars such as Soane Tonga’uiha and Brian Mujati depart for France. Saints, who had started to become the nearly men, showed their ambition by using the cash to make the signings that would finally drive the team to glory. Alex Corbisiero, Kahn Fotuali’i and George North were among the world class talent drafted in during the summer of 2013, along with highly-rated attack coach Alex King. It took Saints to another level as the fresh faces brought a fresh belief that not only could the club compete, it could beat the best. And, sure enough, a year later they had their major title. Not only did they win the Aviva Premiership, but they gave their supporters a season in the sun that will never be forgotten. It was a magical campaign, during which Saints also reached the Anglo-Welsh Cup final and claimed the Challenge Cup, beating Bath in the final eight days before Saracens were defeated in dramatic fashion in the Premiership showpiece. Those three weeks, which also included an incredible last-gasp play-off semi-final success against traditional rivals Leicester Tigers, must go down as the greatest three weeks in the history of this proud club. And Mallinder, his fellow coaches and the team they shaped provided it. An abiding memory of the director of rugby will be watching him trying to leave the team coach after it returned to the Gardens after Saracens were slayed in extra-time at Twickenham. Mallinder, usually so unflappable and composed, stood on the steps of the bus and joined in with real gusto as ‘come on you Saints’ echoed around. His smile was as wide as the Tetley’s Stand. It was a surreal moment at the end of a surreal season. The culmination of all Mallinder’s hard work and the reward for all the building blocks he had put in place during the previous seven years. However, when 2014 ended, it felt a little like Saints’ magic had faded. There was another courageous victory against Leicester in the December of that year, but after that, Saints’ halo seemed to slip. Yes, they did finish the season top of the Premiership tree, but they suffered a play-off semi-final defeat to Saracens that somehow seemed slightly inevitable. They lost Samu Manoa to cash-rich Toulon during that summer and the perennial player of the year left a huge hole in the team. 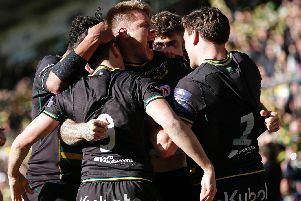 Saints finished outside the top four for the first time since 2009 in 2016, and the departure of attack coach Alex King in the October of that year left a slightly bitter taste in the mouth. The search for solutions was starting to seem fruitless and players who had served them so well for so long, didn’t possess the same vim and vigour. Saints were to finish seventh last season, sneaking into the Champions Cup via the back door, beating Connacht and Stade Français in the play-offs. There was renewed hope that with the likes of Rob Horne and Piers Francis drafted in, Saints could be a major force again. But after four fine wins in September, it just never materialised. And the past few weeks have been the nadir of Mallinder’s career at the club. Saints have lost nine of their past 10 games and last Saturday’s 43-32 defeat to Ospreys at a sparsely-populated Gardens was gut-wrenching to say the least. It was sad to see so many empty seats, such a loss of faith in a once great team. Everyone seemed to have run out of answers when it came to finding a way of turning things around. But to focus on the past couple of weeks, months or even years would be wrong when it comes to viewing Mallinder’s time at Saints as a whole. Far more significant is what he brought to Northampton during the first seven years of his tenure. The players he picked up from the wilderness and turned into internationals. The Academy graduates he formed his squad around. The memorable victories he masterminded in Europe. The way his team bounced back against Ulster to win in Belfast in 2012. The way his team recovered from a humbling home defeat to Leinster to win in Dublin in 2013. They way his team beat Leicester in that play-off semi-final of 2014. The way his team kept fighting until the end and eventually forced their way to victory against Saracens in the grand final at English rugby HQ. His team was one to be proud of for so long. And when he sits back and reflects on his time at Northampton, it should not be regret he feels, but a sense of satisfaction. That is how the Saints supporters will feel in years to come. And that is why Jim Mallinder will go down as one of the greatest coaches Northampton has ever had.